In the midst of a national opioid epidemic that claims the lives of 15 Floridians every day, Attorney General Pam Bondi has filed “the most comprehensive lawsuit in the country” against the nation’s largest opioid manufacturers and distributors, making the announcement at Riverside Recovery of Tampa, a drug and alcohol treatment center. Florida Attorney General Pam Bondi speaks at Riverside Recovery of Tampa, where she announced the state's lawsuit against pharmaceutical companies and their role in the opioid epidemic. 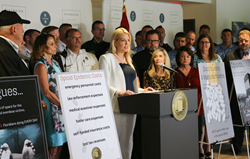 Surrounded by law enforcement officials and families of opioid addiction victims, Florida Attorney General Pam Bondi announced her comprehensive lawsuit Tuesday, May 15th in Tampa, Florida. “We are not scared to take them on,” Bondi stated during her press conference at Riverside Recovery of Tampa, a drug and alcohol rehabilitation center, referring to Purdue Pharma LP, Endo Pharmaceuticals, Inc., Janssen Pharmaceuticals, Inc., Cephalon, Inc. and Allergan, the large pharmaceutical companies that were listed in the suit. According to Bondi, the drug companies published misinformation about opioids, and utilized “front groups” that marketed and campaigned for the use of opioids, while down playing their risky, addictive nature. Lisa Brandy, whose daughter Brandi fell victim to her opioid addiction just 18 months after being prescribed opioid medication, knows the pain and destruction all too well. Florida is not the only state hoping to hold the pharmaceutical companies accountable for the opioid crisis. The states of Nevada, North Carolina, North Dakota, Tennessee, and Texas all filed lawsuits on Tuesday, joining hundreds of local governments who have already sued the manufacturers and distributors.